Eirik Stubø is a Norwegian theatre director awarded for his Wild Duck production shown in New York in 2006. He is currently working for Sweden’s national theatre, The Royal Dramatic Theatre, as an artistic and managing director. Last year I got a chance to see his work on two different adaptations of major tragedies. One of them was Oedipus/Antigone staged at the Royal Dramatic Theatre in Stockholm, the other was Mourning Becomes Electra staged at the Norwegian Theatre in Oslo (Det Norske Teatret). Stubø’s new stagings underlined inner, repressed feelings, the recurring and inherited motifs in the plays. He prefers to show these motifs on a bare, empty, and nearly dark stage without emphasizing where/when “here” is. In both performances, one could easily see the same motifs such as haunted feelings, desolation, suffering, and covertness emerging from a misty stage. It seems that director Stubø’s mind and his stage are preoccupied with these concerns. Oedipus/Antigone was premiered on 3 November 2017. It is a re-written text in two acts, derived from Sophocles’ Oedipus The King and Antigone. The first act tells Oedipus’ story (performed by Reine Brynolfsson) and the second one tells Antigone’s (Sanna Sundqvist), connecting them to the same destiny. There is a huge, gloomy, empty stage apart from a few chairs. It is filled with smoke/mist and painted black. All characters seem very exhausted and they perform quite slowly as if they had just suffered a great catastrophe, as if everything has died, as if from the first moment everyone knows the truth and also what will happen at the end. There isn’t any sensational or shocking scene. Even when Oedipus and Iokaste learn of their incestuous marriage, their reactions are kept to a minimum. Performers act as if they are someone between their role and themselves, especially when they speak at length to the audience. Instead of using the chorus, a man and a woman (Per Mattsson and Kicki Bramberg) tell the story and what happened in the omitted scenes. For example at the beginning of the second act, they tell what happens after Oedipus’ death, how his sons died in the fight for the throne. In the first act, there is a dense mist onstage which increases with Oedipus’ guilt as his past is revealed. The stage seems narrow, but it is not possible to perceive its borders. The mist slowly disappears toward the end of the first act when everything that happened in the past is revealed in the present time of the play. The stage, then, enlarges. This is the same for Antigone. When second act begins the stage is again shrouded in mist. But this time the audience sees Kreon (Hannes Meidal) in the same position, with the same fear, the same hubris as Oedipus. Indeed, he sits on the same chair as Oedipus and he blames everyone. We see, for example, Teiresias (Gunnel Lindblom) at the beginning of Oedipus talking to him and at the end of the Antigone talking to Kreon in a similar conversation. Let me note that this Teiresias is very different, an old woman, not guided by a young boy but by a dog. Like the similarities between Oedipus and Kreon, there is also a similarity between Oedipus and his daughter, Antigone. In the first act, we saw Oedipus’ blinded face on the back wall. Likewise, at the end of Antigone, we are shown her waiting in a confined space displayed on the back wall. 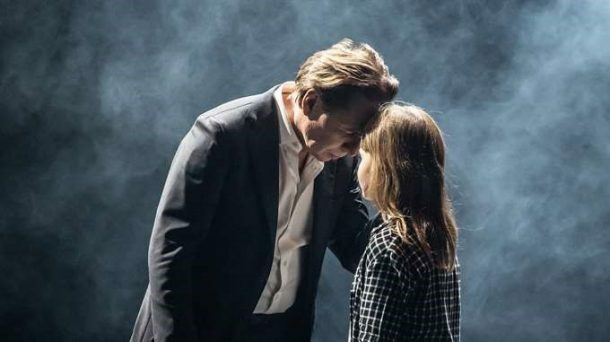 After everyone dies in the tragedy, we are also shown a young girl left alone, Ismene (Ellen Jelinek), who doesn’t know where to live, where to go in this empty (world) stage. The most striking thing in this performance is a sense of spatial uncertainty that I think director Stubø achieved through a stage language of its gloomy atmosphere and the acting style which can also be traced in Mourning Becomes Electra. Where is here? Is it a King’s palace, a house, or only a stage? When is here? Is it happening in a distant past, or now? What is the distance between the character and the performer? Is he the actor who becomes Oedipus or who narrates Oedipus? The misted stage not only refers to the misery, uncertainty, and hidden truths of Oedipus’ story but also is a metaphor fornhow this tragedy can be perceived and staged. It can be said that the stage or the scenography works like a dramaturgical device. All of these features can be seen in his other tragic staging, Mourning Becomes Electra. For Eugene O’Neill’s Greek tragedy adaptation, Mourning Becomes Electra, set designer Kari Gravklev creates a jazz bar stage with a music group, a piano, and a few chairs, instead of a middle-class living room. The top of the piano is used as a whiskey bar counter. Also, black and white photographic images and movie montages are reflected on the back wall of the stage. Likewise, the actors appear not in historical costumes but in modern fashionable dress as they do in the Oedipus/Antigone. The stage has again some smoke. Mourning Becomes Electra, staged at the Norwegian Theatre on 12 June 2017, Photo by Erik Berg. Similar to O’Neill’s play, the performance consists of three parts, unfolding the destruction of a modern family with particular emphasis on certain elements both recurring and spreading, more precisely, haunting and haunted feelings deep in the characters’ hearts. Various theatrical devices are used in order to expose the characters’ innermost painful and passionate feelings. Actors sing songs such as The Doors’ “Riders on the Storm” and Deep Purple’s “Child in Time.” The singing expresses their inner world, and they also make a last singing appearance on stage before they die. All the characters dying in the course of the play, for instance General Mannon, Adam, Christine, and then Orin, heartbreakingly sing a final song as a sign of their farewells. This makes the performer not only a soloist, but part of an ensemble with the jazz band in the middle of the stage. Similarly, at the beginning of the performance all the actors appear on stage as if coming together in a jazz bar where they chat, laugh, drink and smoke. The plot follows this scene with the title of the first part, “Homecoming,” on the back wall. The actors find the opportunity for both a physical and musical performance, where a wide range of staging techniques from multimedia devices to staging a live music show are used. On the back wall, stormy and autumn landscapes express the feelings of the younger generation. Also, we are shown the mother’s memories of a time before the action of the play begins. The choreography highlights the emotional distance between characters, who look distant, cool, self-enclosed, and somewhat absorbed or lost in memories. This is most palpably evidenced by the scene where the mother, Christine (Gjertrud Jynge) becomes very withdrawn after her lover Adam’s death. She usually sits at the front of the stage and speaks with Lavinia (Kirsti Stubø) without glancing backward. Such scenes of conversation are emphasized with a black-and-white movie that reflects the performer’s face in close-up on the huge back wall. As a character begins to sing his/her last song on stage s/he also acts out all the things long-suppressed. By the same token, as the back wall opens towards the end of the performance, an entire starry night gradually emerges in the huge space behind. All these details are very impressive scenic inventions, not only because they are an amazing display of visuality, but also because they reflect the psychology of the character. 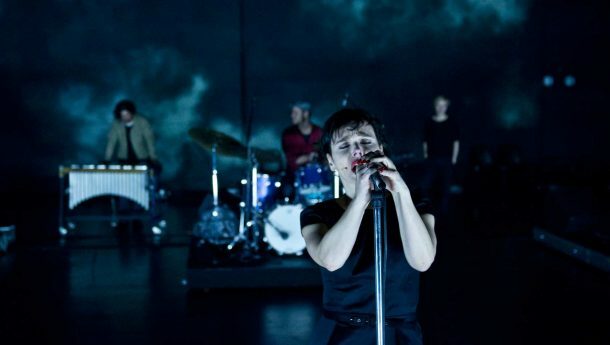 Stubø’s staging has created a multimedia performance where music and image combine to illustrate the repressed and haunting inner feelings as the drama and characters unfold. * I would like to thank to Mimmi Fristrop from The Royal Dramatic Theatre in Stockholm and to Ida Michaelsen from Norwegian Theatre (Det Norske Teatret) for their kindly inviting me to these performances.